France uses emergency laws to place climate activists under house arrest. 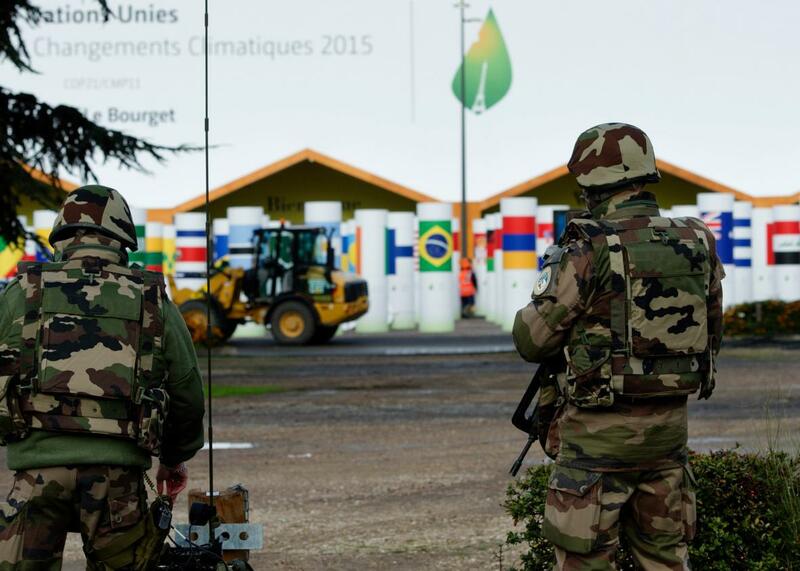 French military stand guard outside the venue that will host the COP 21 UN climate conference, on November 25, 2015, in Le Bourget, north of Paris. At least 24 activists who advocate for climate change have been placed under house arrest ahead of the highly anticipated United Nations talks in Paris. France used emergency laws that were implemented after the Paris shootings to arrest the green campaigners, the French government confirmed on Saturday. Earlier, the Guardian had reported the news, noting that the warrants delivered to the activists cited state of emergency laws that were imposed after 130 people were killed in terrorist attacks earlier this month. French Interior Minister Bernard Cazeneuve insisted the activits were planning to carry out violent protests at the talks. “These 24 people have been placed under house arrest because they have been violent during demonstrations in the past and because they have said they would not respect the state of emergency,” Cazeneuve said in a speech, according to Reuters. It’s not that the French government thinks green campaigners are tantamount to terrorists, but rather that their actions could distract law enforcement from the most important task. “These people have no connection at all with the terrorist movement, but our forces need to be totally focused on the protection of the French people,” Cazeneuve added.